If you're interested in one of the best Nvidia GeForce GTX 1070 cards, stop right here and see if there's a great component at a great price for you. We think it's still fair to say that the Nvidia GeForce GTX 1070 card's reputation and performance is such that its still relevant for PC gaming in 2019. Its pedigree and influence is such that its Ti brother ranks highly on our list of the best graphics cards. 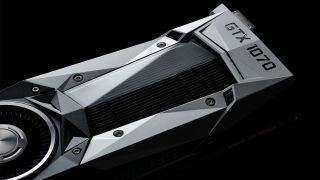 In all the ways we've tested it, the 1070 always matches and exceeds the performance of its closest rivals, the GTX 980 Ti and the GTX Titan X, and punches consistently well for its weight given its length of tie on the market now. Compared to those two nearest rivals, it boasts the benefits of being more affordable and less power hungry, and compared to the 1080, while it can't match it's overall performance, it still shares in all that makes it's elder sibling good: the Pascal architecture; the 8GB of VRAM; 16nm FinFET technology; improved delta color compression; and simultaneous multi-projection. It's worth checking out our review of the card will provide more info on what makes it tick. Therefore, one of the best Nvidia GeForce GTX 1070 cards is still worth your time and consideration. And to help inform your consideration, we've rounded up the best deals and prices going for the 1080 from all the major players,along with some extra info on each and their range. The reference card specs for the GTX 1070 have a base clock speed of 1506MHz and a boost clock speed of 1683MHz, with a memory speed of 8000MHz. It's pertinent to keep in mind that some of the below cards will be custom GPUs and so may have boosted specs, custom coolers, and so on—but this remains the optimal place to find the best GTX 1070 deals. To check out the alternatives going upward in capability check out the best Nvidia Geforce GTX 1080 deals and the best Nvidia GeForce 2080 prices to complete your research. EVGA has a whole range of custom GTX 1070 options available, some of which are even water cooled if you don't want to do it yourself. The EVGA GeForce GTX 1070 FTW Hybrid has a base / boost clock speed of 1607 / 1797MHz, with an ever so slightly boosted memory speed of 8008MHz. All you have to do is plug in an extra couple of power cables, secure the radiator and fan to the back of your case, and you've got a powerful water cooled card ready to go. Asus has plenty to offer on the GTX 1070 front too. The ROG Strix O8G Gaming GeForce GTX 1070 is a monster card with three fans and a major performance boost. In OC mode, the card runs at 1657 MHz base clock speed (nearly as high as the boost clock speed on the reference card), with a boost of 1860MHz. Plus the memory speed has been nudged up to 8008MHz. It's not massively pricey either, with an MSRP of $450. MSI's GeForce GTX 1070 Gaming Z 8G has the same base / boost clock speed of the Asus card mentioned above in OC mode at 1657 / 1860MHz, but the memory is even faster at 8108MHz. Two big fans and a large heatsink keep things cool, and it actually remains fairly quiet too. It's a little more expensive, but there are cheaper options available, or you can go all out and get the pricey MSI Sea Hawk EK X water cooled 1070. If you're looking for power, but don't want to fork over the cash for a GTX 1080 or Ti, the Gigabyte GeForce GTX 1070 Xtreme Gaming card has some serious stats. In OC Mode, the base clock is 1695MHz, and the boost clock is a whopping 1898MHz. Also when in OC Mode, the memory is boosted all the way up to 8316MHz. To keep all this overclocking cool, there are three 100mm fans overlapping each other. Plus this model comes with a handy extra 2 HDMI ports. PNY's option for the GTX 1070, the XLR8 Gaming OC, has a base clock of 1607MHz and a boost clock of 1797MHz, with the memory speed at 8008MHz. Not mind blowing stats compared to some of the others on this list, however the triple fan cooler stops the overclock getting too hot and it's also pretty quiet. Only one 8-pin power connector needed too. Zotac has a big old 2.5 slot GTX 1070 Amp Extreme with some decent overclocks if you're looking for that extra performance. A 1632 / 1835MHz base / boost clock speed, with the memory tuned up to 8208MHz, there's a lot to like about this one. Three fans on the top and six heatpipes underneath keep everything running smoothly. Plus it looks pretty nice, and also has some extra LEDs if you're into lighting the inside of your case. GALAX has a few options available, one of which, the Virtual Edition, has an image of a man covered in red bandages for some reason. This card also blows hot air directly out of your PC case rather than letting it circulate inside. GALAX also has some higher performance cards available, such as the 2.5 slot HOF edition which has a base / boost clock speed of 1620 / 1822MHz. You'll have to import this one if you're in the US, but the Inno3D GeForce GTX 1080 iChill X4 Edition is a beefy graphics card with decent overclocks and a nice big cooler. With the clock speeds driven up to 1620 / 1822MHZ base / boost, and the memory up at 8200MHz, it's no wonder this card needs four fans to make sure everything's cooled properly. There are some other options with slightly less over the top coolers attached too. Gainward has a simple card with the reference specs, but it uses its own slightly modified cooling system. Alternatively, the Phoenix GLH is a massive 2.5 slot card with two 100mm fans. Plus it has two BIOS settings, with factory overclocked settings on one, and your own overclocks on another. The base / boost clock speeds are up at 1670 / 1873MHz, and the memory is slightly tuned to 8008MHz. Plenty of Palit options, but the one which sticks out is the GameRock Premium Edition with the G-Panel. Much like its GTX 1080 equivalent, the panel is an LCD display which shows all the system essentials. It also gives your PC an extra USB 3.0 type C and USB 3.0 type A port. Plus the card itself has good clock speeds at 1670 / 1873MHZ base / boost, and a frankly humongous effective memory clock speed of 8500MHz.